Have you ever wished you could just sit down and have a long talk with the Lord? Wouldn't it be wonderful to move beyond having a theology that states that God loves you to actually hearing Him whisper words of love into your heart? When you're worried or confused, wouldn't you love to see the situation from His perspective and hear how He wants you to respond? When things don't seem to be going your way and your prayers aren't answered the way you had hoped, wouldn't it be great to hear Him tell you where He is in the midst of it, and what He is working out in your life? Are you ever just a little bit jealous of others who say with such confidence, "The Lord said...."? 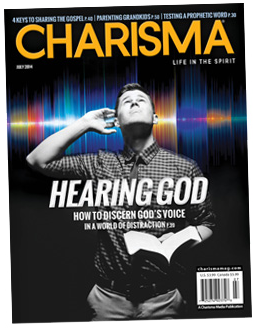 The “4 Keys” Featured in Charisma! If you are one of His sheep, then He is speaking to you and you are hearing His voice! The problem is that we have not learned how to recognize His voice and differentiate it from all of the other voices that bombard our hearts and minds. 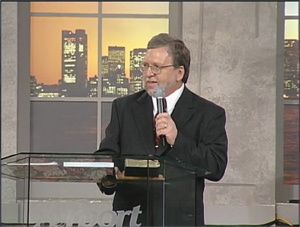 Mark Virkler's teaching on the four keys to hearing God's voice has helped thousands of people of every age on every continent begin to recognize the voice of the Lord within their own hearts clearly and consistently, leading to a deeper intimacy with Him as well as greater faith, hope and joy in their lives. Wouldn’t it be incredible if you clearly heard God’s voice every single day for the rest of your life? As a result of this teaching, you can receive daily direction from the Wonderful Counselor Who encourages you and guides you in cultivating great relationships with family and friends. You will learn divine patterns for approaching God and four vital keys that will allow you to clearly hear God’s voice every day. You will begin to discern God’s voice from other voices which clamor for your attention and how to record what God reveals to you using two-way journaling as you confirm it through a variety of methods. You WILL experience Jesus’ guarantee that, “My sheep hear My voice”. Your life will be transformed! When you combine the book 4 Keys to Hearing God's Voice with CDs for easy listening in the car and the DVDs for dynamic training of your small group, you have everything you will need to internalize this training on How to Hear God's Voice. This is the MOST PRACTICAL training series in the world teaching you how to hear God's voice! Looking to purchase the audio unabridged version of the book? See this link. Looking for United Kingdom Distributors/Trainers? Check out this link. What makes the 4 Keys to Hearing God's Voice better than the previous version, How to Hear God's Voice? Since 1979 this teaching has been published under the names Communion With God, then How to Hear God's Voice and now, 4 Keys to Hearing God's Voice. We're #1 in training people how to hear God's voice! The 10-hour DVD teaching series now matches the 10 chapters in the book! This training module lets YOU help us saturate the world with God’s voice! Amazing examples of two-way dialogue inspire you to begin journaling. Through personal journaling exercises, you develop greater intimacy with God and hear what He has to say about your life, your hopes and the dreams He has for you. You begin immediately identifying God’s voice! You do not need to wade through half the book to discover what the 4 keys are! Now you spend more time developing the art of two-way journaling. You are speaking life, thus prospering your way (Prov. 18:21). of spiritual realities are given. Giving you better understanding, greater faith and enhanced spiritual intimacy. You acquire an increased ability to walk in the anointing. 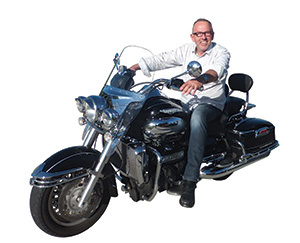 Links to hours of online interviews with Dr. Mark Virkler. Watching and hearing this anointed teaching breaks yokes and instills faith! These, plus free book downloads, add hundreds of dollars of value to this purchase. You Can Achieve 100% Success in Teaching Others to Hear God's Voice! Learn to impart generational advancements in the realm of the Spirit! We must pass on to our children the truths God has given to our generation. We want them to possess what we have battled for, so they can stand on our shoulders and advance the Kingdom by going further than we have gone. Don’t make them "reinvent the wheel." Teach them how to receive God’s voice and God's vision easily as the GIFTS they are from Him. How to Hear God's Voice Training Is Widely Acclaimed! A key to the revival that broke out in Toronto - Catch the Fire church has had Mark Virkler teach this seminar more than 50 times in a 12-year period. They have made it one of their core values, and John Arnott attributes this training on how to hear God's voice as one of the keys to the revival. In addition, John says, "Dialogue with God is worth a million dollars to any Christian who is serious about the issue of hearing the voice of God. 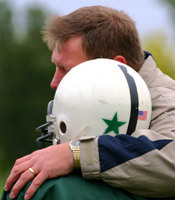 Mark's teaching on this issue profoundly impacted my life." 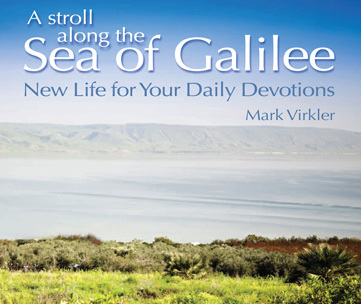 Sid Roth - Sid has interviewed Mark Virkler for his "It's Supernatural" program on the topic of How to Hear God's voice. Enjoy free radio and TV interviews. Canadian Television - 100 Huntley Street has created an 8-minute production with Mark Virkler on Hearing God's Voice. Seminars on six continents - Since the early 1980's, Mark Virkler has taught on hearing God's voice in about 30 seminars annually in churches around the world. Some of the schools where Mark has taught this course include: Catch the Fire SOM, Revival Fires, International School of Ministry, Youth With a Mission, and Global School of Supernatural Ministry. Dialogue With God has remained on Bridge-Logos’ Top 20 Bestsellers list since they first published it in 1986. Over 200,000 copies of this message have been sold under its various names (Communion With God, How to Hear God's Voice, 4 Keys to Hearing God's Voice, and Dialogue With God)! A network of trained instructors - Over 60 "Certified Facilitators" teach this course worldwide. Additional endorsements and testimonies are available here. The DVDs and CDs correspond with the 4 Keys to Hearing God's Voice book and LEARN 4 Keys to Hearing God's Voice notebook. For maximum growth and internalization, we recommend utilizing them both along with either the CD or DVD set. One copy of the book per family is fine, and one LEARN notebook for each individual is recommended. The LEARN notebook provides an outline to follow as you watch the DVDs or listen to the CDs. Also included are application exercises and classroom activities. For maximum results, draw together some friends into a home group or Sunday school class and watch the DVDs over a 10-week period. Practice the four keys weekly, sharing your results together. The DVDs bring an anointed trainer to your group, and your interpersonal sharing gives you instant feedback and confirmation that you truly are hearing God's voice! An unbeatable combination. A brief overview of the four keys can be found here. 4 Keys to Hearing God's Voice DVD Package Includes ALL These Amazing Resources! 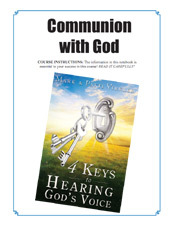 Details of Each Item Included in the "4 Keys to Hearing God's Voice DVD Package"
This is the Virklers' signature book, and it clearly and practically presents everything you need to learn in order to easily hear God's voice. It will help you move away from rationalism into Holy Spirit encounter, bringing you to the place of two-way journaling where you write down your personal dialogue with Almighty God. You will learn to test the revelation you receive in your heart against the Bible and with your spiritual advisors so that you grow in accuracy, confidence and faith. This is the most practical book on the market today teaching people how to hear God's voice. If teaching this in a group, we would recommend at least one copy of this book per family. This is suggested for ages 15 and up. 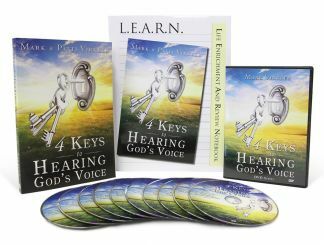 These are ideal for focused learning with the LEARN 4 Keys To Hearing God's Voice notebook and for use in classroom settings. They are identical in content to the CDs. For maximum results, draw together some friends into a home group or Sunday school class and watch the DVDs over a 10-week period. Practice the four keys weekly, sharing your results together. The DVDs bring an anointed trainer to your group, and your interpersonal sharing gives you instant feedback and confirmation that you truly are hearing God's voice! An unbeatable combination. Every single issue of our free monthly email newsletter, "God's Voice Worldwide," includes fresh new journal entries from around the globe. Sign up for this free newsletter near the top of the right-hand column of this website. An archive of these newsletters which are full of inspirational life stories and testimonies is available here. downloadable "4 Keys" desktop wallpaper for your computer, and more. Click here to download a brain preference indicator test. Request up to 25 of the 4 keys cards FREE with every order you place! (Excluding download-only orders.) Just specify how many you would like when checking out in the shopping cart. You can also put these 4 keys on the back of your business cards! Imagine how that changes the dynamic of handing someone your business card, and the substantial increase in perceived value to the recipient. 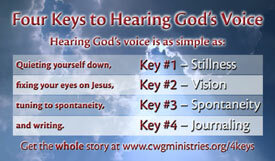 Handout worksheet for teaching the 4 Keys to Hearing God's Voice <---- New!